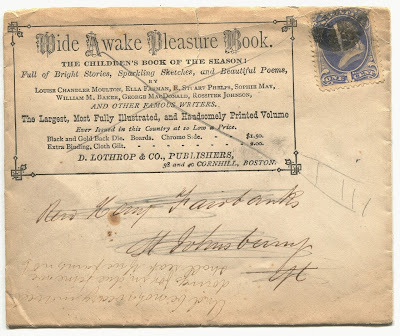 In 1875, Boston publisher D. Lothrop & Co. advertised a book on the envelope below, presumably in time for Christmas since they referred to it as "The Children's Book of the Season." The back side of the envelope offers additional evidence that Christmas was approaching. More on that in a minute. 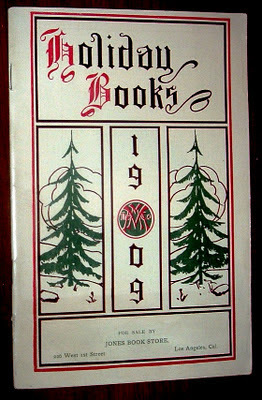 The book is Wide Awake Pleasure Book, and it came out about 1875, as best as I can tell. I have come across only one bookseller claiming a first edition of this book and the year given was 1875. The address for D. Lothrop & Co. offers a clue as well. 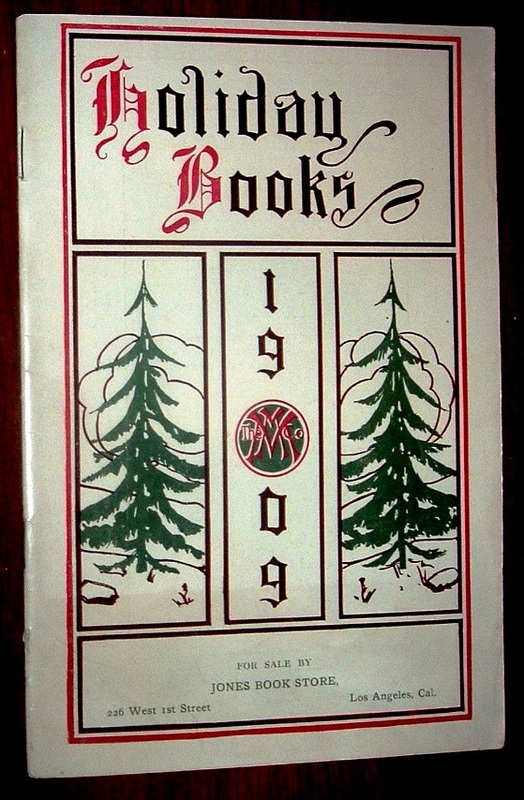 Daniel Lothrop, according to a Wikipedia page about him, established his publishing business at the Cornhill address in Boston indicated on the above cover above in 1868. 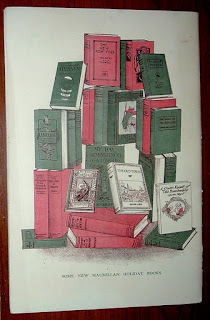 In 1874, he began publishing a magazine for children that shares the name of the book advertised on this cover. A year later, the Wikipedia article states, he needed more space and moved from his Cornhill address to another Boston location. If the dates are accurate, the Wide Awake Pleasure Book must have been one of his last published books at the Cornhill office. 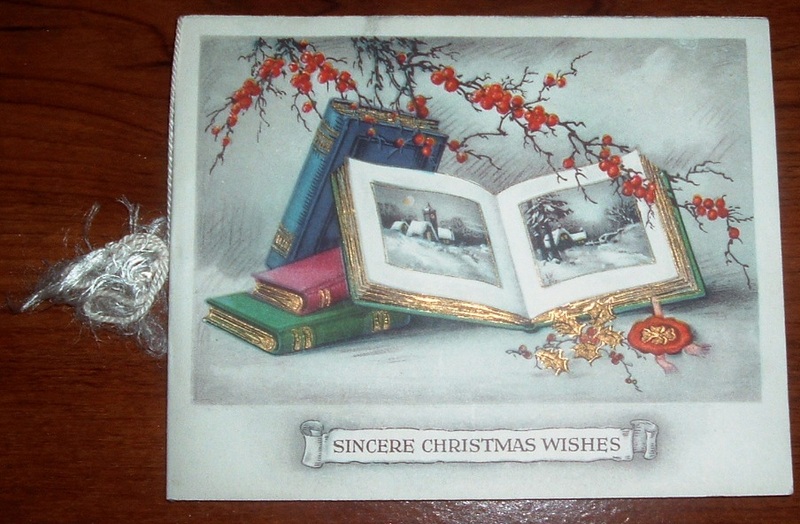 By the way, the Thoughts of Bibliomaven blog offers a good bit of information on D. Lothrop & Co. with wonderful images of various books and ephemera, including the latest entry--a Christmas greeting. 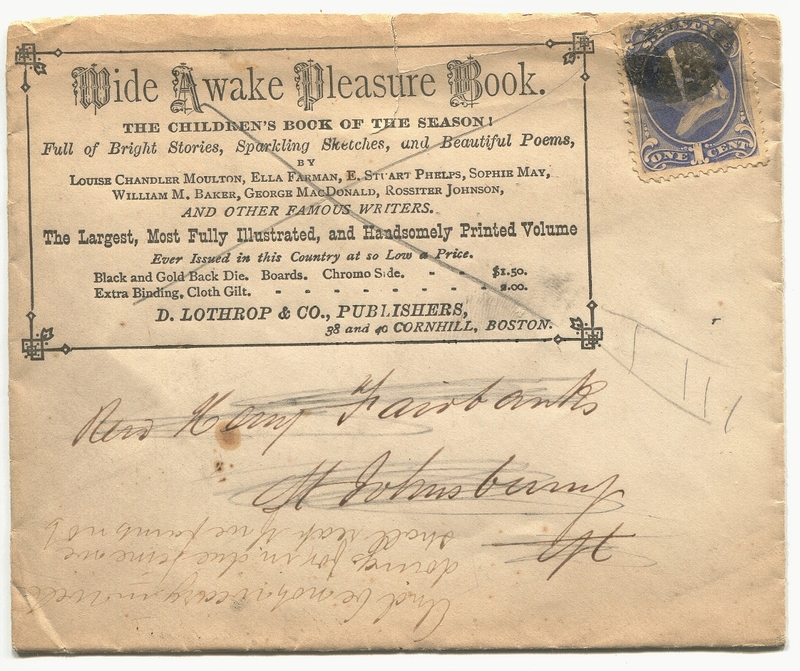 More points of issue for the bibliophile or collector are revealed in the envelope's ad copy, which states this book is the Largest, Most Fully Illustrated, and Handsomely Printed Volume Ever Issued in this Country at so Low a Price. Evidently, this ad is for a later printing of the original edition. 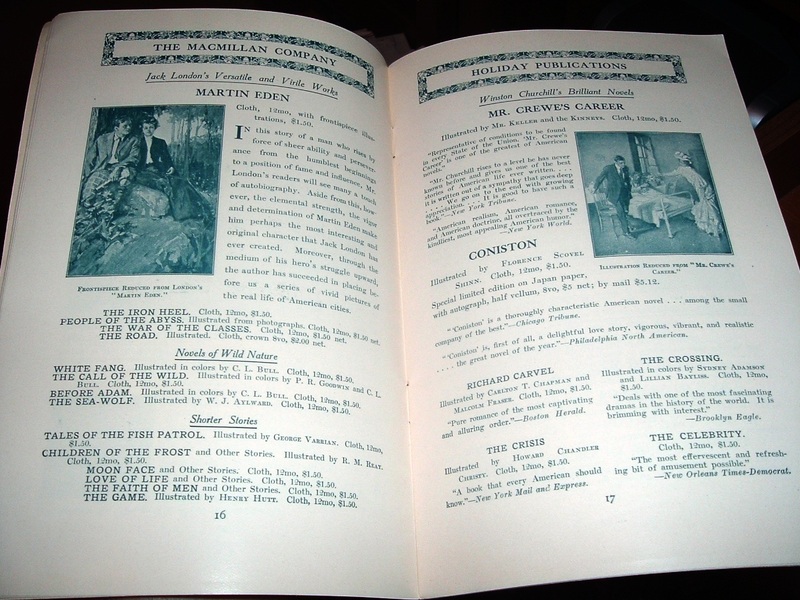 The book may have been a collection of writing from the popular magazine of the magazine of the same name and was itself popular enough to go through several editions at the Cornhill offices before the company relocated just a year later. 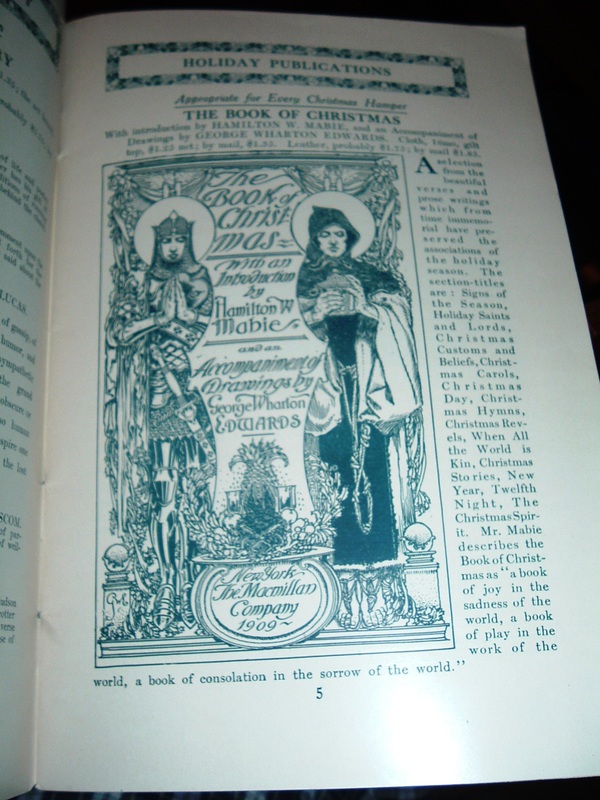 Aside from the bibliographic content on this cover, a bit of Christmas conjecture comes to mind in the form of a seasonal sermon and perhaps the wishes of child at Christmas time. The envelope is addressed to Rev. 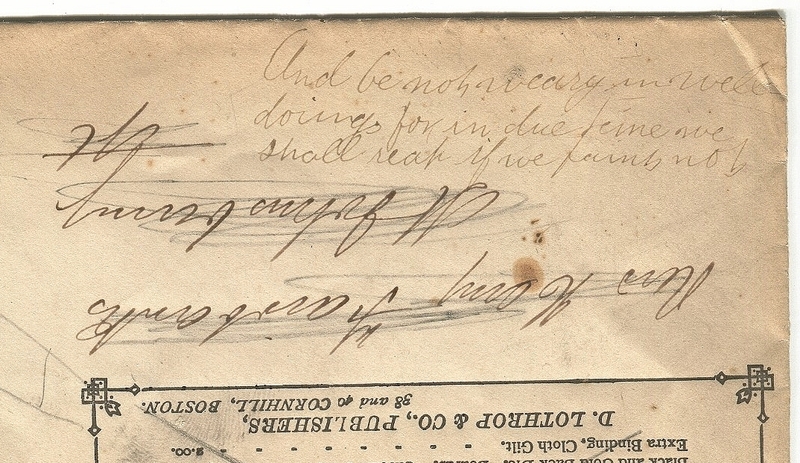 Henry Fairbanks of St. Johnsbury, Vermont (scratched out at some point). 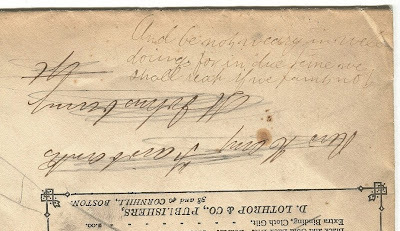 Turning the envelope upside-down, there is a Bible passage written in pencil below the address: And be not weary in well doing, for in due time we shall reap if we faint not (which I determined to be from St. Paul's Epistle to the Galatians). Perhaps Rev. Fairbanks was drafting a few notes for a sermon--perhaps even a Christmas sermon with a message of charity and doing good deeds for others. 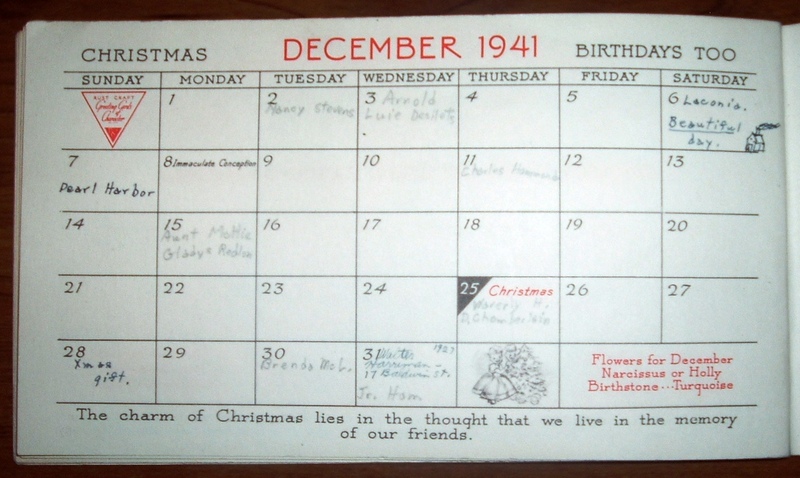 On the back of the envelope, in what looks to be a child's handwriting, there is an apparent address for St. Nicholas at December Holiday Harbor 74 (? ), Grand Central Depot. 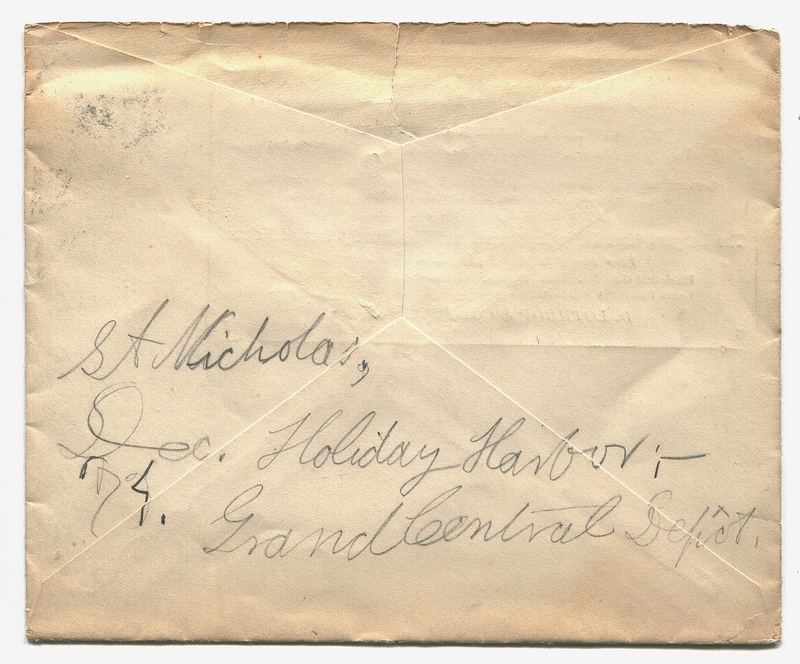 I've searched a number of combinations for the words above and cannot find anything related to "letters to Santa Claus" and Dec. Holiday Harbor and Grand Central Depot. So I can only wonder if Rev. 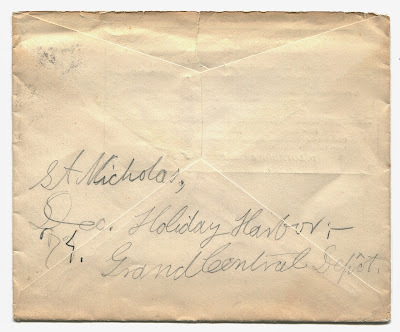 Henry Fairbanks' name was scratched out by a child of his in an attempt to recycle this envelope to Santa with a Christmas wish for the book advertised on the front side. 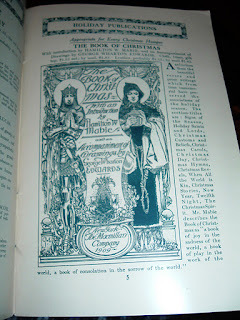 If so, I wonder if Santa heeded the Bible verse under that book ad and was not weary in his well doing Christmas Eve and put a certain book under a certain St. Johnsbury Christmas tree for a Christmas Day long ago in 1875? 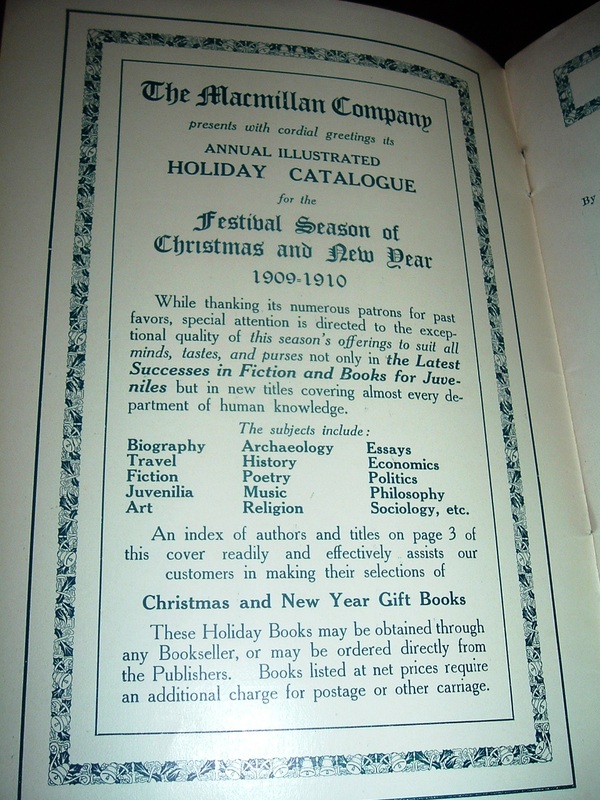 More than one hundred years ago--1909 to be exact--somebody probably enjoyed browsing new books in this holiday catalog from Jones Book Store in Los Angeles. 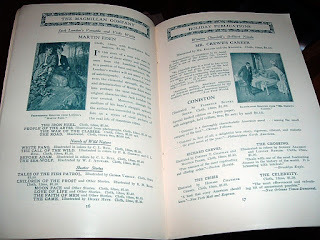 Today, I am enjoying browsing the antiquarian selections from this now old catalog. 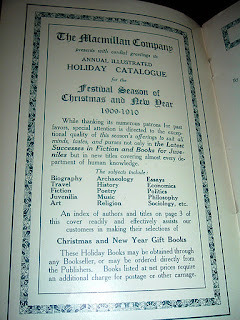 But it is one of the best preserved old bookseller catalogs of this vintage I've run across. Lest the catalog reader be confused by the title about what kinds of books Jones' Bookstore was selling, they were not books about Christmas, the image above being the lone title. Most books appearing in this catalog seem to deal with exotic lands around the world, travel, history, biography, and a smattering of juvenile and religious works. Popular novelists of the day were not excluded either, as evidenced by the books of Jack London, shown below (featuring Martin Eden). Of the second-hand booksellers of 1897, Frederick D. Jones was a picturesque and aggressive character. I recall well the big rambling place, with balconies and crowded aisles at 226-28 West First Street. It was the mecca for school books, old and new for a whole generation of Los Angeles youth. Mr. Jones was born in South China, Maine, November 30, 1855. He seems to have been the only early Los Angeles bookseller to get a college education. He graduated from Haverford College in Haverford, Pennsylvania in June, 1882. He came to Los Angeles from Kansas City in 1886 and January 1887 opened Jones' Bookstore at 45 South Main Street and a year later at 53 South Main Street, which was the northwest corner of Second and Main. In 1890 he moved to 226 West First Street where his shop was a landmark for so many years. Mr. Jones was not a rare book dealer, but was a merchandiser of all kids of secondhand books. He had large sections of religious, medical, reference, and law books, carrying some popular titles new. One of the entrances was given over to cheap books, 2 1/2c, 5c, 10c and25c shelves and sections which always made for attractive browsing. In buying libraries I still frequently come across the deep pencil marks of Mr. Jones and the universal rubber stamp with which he "disfigured" all books he sold. Mr. Jones carried quite a stock of stationery, manufactured his own ink, published a few books and patented and marketed a rapid addition and multiplication device. He was an Odd Fellow and was active in various Civic Organizations. He called himself an "Evolutionary Socialist." When, in 1904 Jones' Bookstore was incorporated, several of his faithful assistants were given blocks of stocks. Through an unfortunate law suit Mr. Jones had to sell his interest in the store. It was taken over by some of the clerks and with some additional capital moved to a larger place on Hill Street between Sixth and Seventh. Later there was a final move to Sixth Street, between Hill and Olive, where during the Depression of the Thirties it disappeared. 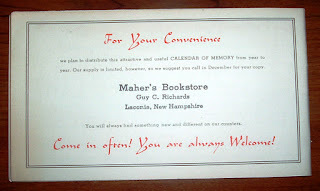 After Mr. Jones left the business, new books and stationery were more and more emphasized and finally I bought out all that was left of the old book department, about 1930. Today is the 70th anniversary of the attack on Pearl Harbor, December 7th, 1941. 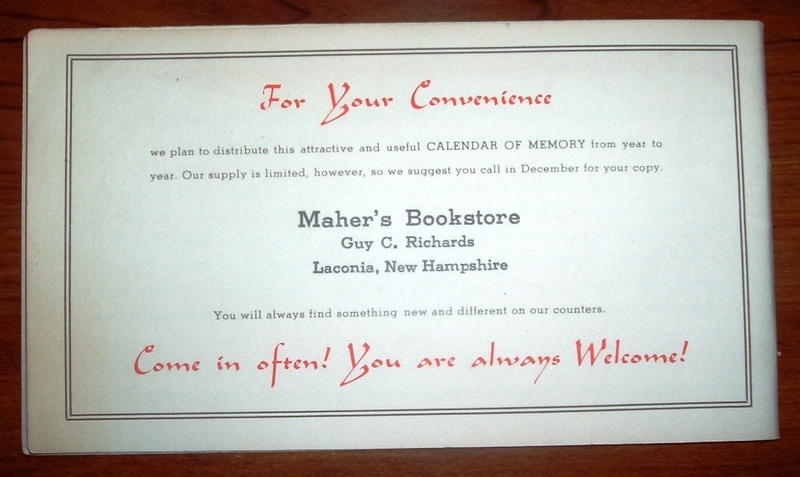 Maher's Bookstore in Laconia, New Hampshire sold the promotional calendar (Rust Craft of Boston) below in 1941. That year would turn out to be quite a significant year in US and world history, for on December 7th the Japanese attacked the US Naval Base at Pearl Harbor in Hawaii, killing more than 2,400, wounding another 1,100. The US declared war on Japan the next day and entered World War II. Lives and nations were changed forever by the events set in motion that day. 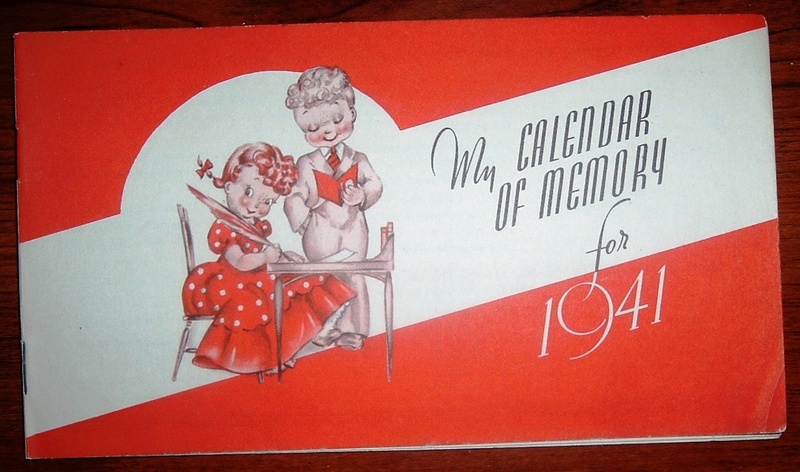 The person who owned this calendar filled it with birthdays of friends who were all teenagers by 1941. That young person may not have immediately appreciated how the course of history would be changed by the events of that day. 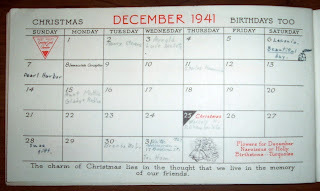 The calendar entry for December 7th simply states: "Pearl Harbor." But, space considerations aside, what else could one say that day as the shock set in about what had just happened and what the attack on America meant for all Americans and a Laconia, New Hampshire teenager in particular? Pearl Harbor. Libraries of words have since been written about that day in 1941, and seeing two words noted in a bookstore calendar the day the attack happened speaks volumes in hindsight about what it all meant. On a side, and personal, note, my father was born in Laconia in 1931 and 20 years later was in Japan, courtesy of Uncle Sam and the U.S. Air Force, having been shipped over during the Korean War just months after marrying my mother. No doubt, the events that transpired December 7, 1941, when he was 10 years old, played a role in his being in Japan on a US military base a decade later after the Japanese defeat in 1945 and subsequent occupation by the Americans.